Bhutanese American at Manchester, NH observed Nepali new year’s celebration amid diverse cultural shows, speeches and well-wishes of the year. The primary aim of the program was to mark the beginning of the Nepali new year 2067 B.S. and to unite all the Bhutanese living in different counties and cities of New Hampshire. 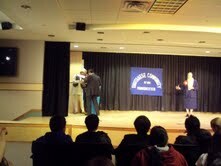 More than 400 Bhutanese from the cities of Manchester, Concord loconia and Masschuetuse gathered on the 16th day of April, 2010 with their respective presentations at South New Hampshire University college auditorium. From 6 pm to 10 pm eastern time Friday, enthusiastic participants, spectators and supporters filled the collage auditorium to its bursting point with applaud, cheers, laughters, spell of the literature, jingles of the music and the charms of the dancers and other performances. The credit for organizing and monitoring the show goes to the Bhutanese communities of Manchester and its outskirts. The program would not come to a successful fruition had the American volunteers not rendered their sincere services. For this reason, the organizing committee extended its appreciations and honors to these local volunteers. They were Kim Calhoun-social worker of Manchester School Depatrment, Doug Hall-social volunteer of NH who is helping Bhutanese refugees in the area, Jessica Sant0s- employment counsellor of Manchester Employment Security Department, Jeena Carrol Planet – social worker and one of the best volunteers for refugees and Sister Irene- social worker from Catholic church. Among many who helped bring the event to its perfect completion were Dev Ashikari, Manju Khadka, Vola Pathak, Lal Khadka, Maya Mishra, Om Basnet, Gaurav Pudel, Sharu Mainali and Kamal Basnet who worked more actively during the prgram. “Thanks to the communities of NH”, Said the organizers for the continued support for and appreciation of their programs in the days to come. Simply want to say your article is as tonishing. The clearness in your post is simply spectacular and i can assume you are an expert on this subject. First of all, I would like to thank the organizing committee for providing this platform to demonstrate the talents that our youngsters possess. Similarly, I would like to thank all the participents from different cities who managed their time to entertain all of us despite their busy schedule. Like wise, my sincere thanks go to all the volunteers who have been helping Bhutanese people selflessly to make us stable, independent and successful. Last but not the least, I wish every Bhutanese of the state to unite together and help eachother for our greater benefit. Well done folks there. This one way we keep united and maintain our culture and at the same time showing presence in different part of US. Happy new Year 2067 to all and Bhutanes USA team for bringing this on. Happy New Year to all and thank you so much to the Bhutanese Community of New Hampshire for their recognition of volunteers at their most recent program on April 16th. The program was very well organized and certainly showcased the wonderful and varied talents of the Bhutanese community. I’m very proud of you for working so hard to unite as a nonprofit in the state. You are not only helping the Bhutanese community, you are helping the volunteers who work tirelessly assisting families. And most importantly, you are shaping the future of our state- your state- of NH. I began volunteering because I understand the hardships that my own forefather’s faced when they came to the US over 100 years ago from Italy- not knowing the language and struggling to maintain their traditions while assimilating to American culture. I continue to volunteer because there is no greater joy than seeing a family succeed, find independence, and find stability in their lives. I have much love for you all. Thanks again. Thank You so much on behalf of all Bhutanese people in USA for the support you gave us to grow up with new hope here. People like you are the reason why Americans are on top of the world. We assure America and Americans that we will try our best to take America to new height.Great job Jenna. Great job Manchester, We all are proud of you all. Keep going with same the things, Thumbs up always.